Ladies and gentlemen, there’s only one game in town this week, and it’s not Said Gadaffi and his suspiciously well-written Ph.D. thesis, oh no. It’s Jamie’s Dream School, which has been slouching towards us for months now; fans of light-entertainment pedagogy have been hugging themselves in anticipation like the Rapture was coming and they’d just been born again. This was worth a month’s worth of drearily wholesome Teacher’s TV. 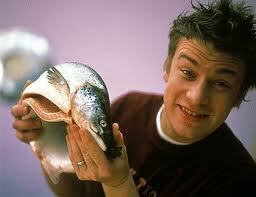 How can anyone not like Jamie Oliver? Sure, he may be approaching near-divine ubiquitousness, only taking a break from the glass teat to allow Gok Wan or one of Simon Cowell’s ravenous combine harvesters to get a look in, but here surely is the Webster definition of having one’s heart in the right place. Boundless enthusiasm, talent and optimism is a cocktail that brings the worst out in other people, I suspect. His School Dinner series actually knocked a few dominoes over, and made at least a few schools hide the Mars Bars- and the sight of those ghastly parents slotting Toblerones and iced doughnuts through the wire mesh fences like angry, red-faced drug dealers to their corpulent, doomed offspring was the most devastatingly upsetting social experiment since Milgram got busy with the dials. Dream School was doomed from the start, though. Not as telly- as telly it’s an uncomfortable work of art, and until Mad Men series 4 arrives in the post (believe me, it won’t even have a chance to hit the carpet. I have a catcher’s mitt next to the letter box) it’s this month’s wide-screen must-have. As an example of how not to teach children; it should be in a glass box and tastefully up lit in the Museum d’Orsay, surrounded by red ropes and brass poles. Teachers will queue to see it, prefaced by solemn warning videos that put it in context. Jamie had a bad experience with school, and only found his calling once he had left, first in cooking, and later in celebrity Essex capering. He was undoubtedly bursting with talent, intelligence, curiosity and probably possessed of a good character. The danger is to assume that all people, all children are like that. There are very good reasons why not every child leaves school with golden scrolls, cups and shields, and frankly sometimes it’s not everyone else’s fault; sometimes it’s down to the kids themselves. It’s ludicrously, childishly naive to say that all teenagers would blossom like tulips if it weren’t for the nasty system that exists purely, it seems, to grind them like grist into grain. By the time they get to secondary school, most children have pretty well developed personalities, habits and character; believe me, the clay is thrown a long time before they get to high school, and teachers face the challenge of taking hundreds of diverse representatives of society and making a decent fist of educating them. Let me assure you that many children by that age do not entirely fancy the idea of school, and are delighted to share this fact with you, in ways that range from swearing at you, laziness, up to (and including) violence. And they don’t do this because they are forced to by a system that doesn’t care. They don’t do this because they haven’t been ‘shown how’ to behave. They choose to do it. 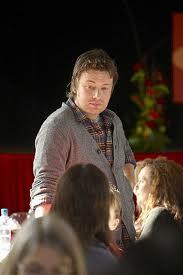 Jamie is fantastic at talking to people; he had the kids eating out of his righteous rudeboy hand. But one of the appeals he made to them was that, ‘You all feel to some extent that education let you down,’ or words to that extent. That simply isn’t true, almost certainly. What’s probably happened is that they didn’t value education; or thought school was an enormous, three-dimensional version of Facebook, where they could chat to their pals and sell Flapjacks. Friends of mine from third-world backgrounds are appalled by how lightly our children (and their families) often treat free education- in their countries, children face a ten mile walk to school and back, if one exists at all. No books are provided. And I feel vaguely ashamed for our over-privileged, flabby ingrates. They’re not in the last chance saloon because no one gave them a chance- they’re there because they didn’t recognise a chance when they saw it. David Starkey, in his brattish, awful way was trying to verbalise this, but did so with so little grace that I found myself siding with Malcolm McDowell in If, taking pot shots at the school masters from the roof top. This was another axiomatic fumble. The idea seemed to be that if only the subject teachers were good enough at what they wanted to teach, then the children would fall into single-filed awe at their mastery. This is far from true. Subject knowledge is a vital part of a teacher’s repertoire, of course- there’s little point being a teacher if you have nothing to teach- but for most teachers, a degree level or equivalent is quite enough to be at least ten steps ahead of the kind of knowledge you’ll need to teach in a classroom. If you don’t believe me, take a look at the majority of GCSE papers. When I started teaching RS years ago, I entered the classroom with a Masters in Philosophy from a decent University and a profound lack of content knowledge about Jewish food laws, or the five pillars of Islam. Petrified at first, I soon found that with a little diligence, I could get on just fine- A-level took more rigour, and a lot of brushing up, but to be educated to one step past the student, and possessed of a little intelligence and professionalism, is enough in most cases to teach a subject at secondary level. Of course, the more knowledge the better, but it’s not a necessary precedent. But this show seemed to rest on the premise that international experts would magically transform the learning of the unloveliest of NEETS. Wrong, dead wrong. The teachers in this program had an abundance of ability and knowledge in their field- and most of it was superfluous to their needs. You don’t need William bloody Shakespeare to teach a room full of kids with no English GCSEs- you need a good teacher who knows the GCSE syllabus. Anything beyond that was unnecessary, like driving to Tesco in a Lamborghini Gallardo Spider- all that juice in the bonnet but nowhere to put it. So our academic sledgehammers were sent to work on the walnuts, and they found it just as hard to get to the good bits without smashing everything to pieces. While I’m on the subject, I’d like to point out that, without prompting, I would put a tenner on the bet that every one of those kids had barely or never heard of the Olympiad of experts Oliver had lassoed into this project, and consider it very safe indeed. The cultural and intellectual circumference of some children is genuinely frightening- Daley Thomson was a legend when I was ruining my Spectrum 48K on his desperate console game, but he may as well be Plato’s next door neighbour for all the impact his name would have on most plimsoll-dodging teenagers today. Robert Winston, Alvin Hall, Alastair Campbell….all stalwarts of contemporary culture, all big noises in their own worlds; but there’s nothing like a teenager’s incomprehension to make you realise that you’re only famous if people have heard of you. None of these kids were likely to go, ‘No WAY, I can’t believe the Poet Laureate is going to teach us poetry!’ because most of them won’t know what a Poet Laureate was. Or indeed poetry. Behaviour management is, I believe I might have said a few times before, absolutely fundamental to good teaching and learning. If you don’t have the kids behaving reasonably well, then you might as well go home, because they’re not going to learn anything. This doesn’t seem to occur to most people involved in running education, apparently, and the number of times I’ve heard people say that interesting lessons will solve behaviour problems…well, it’s a lot of times, let’s just say that. This was joylessly proven every single lesson in the program as we watched how quickly they were ruined by pointless, self-referential teenage jibber-jabber, as all the big gobs were determined to have their say no matter what. 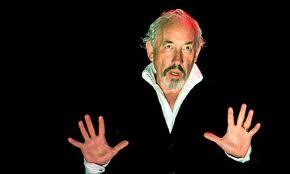 It was deeply uncomfortable to see the apparently lovely Simon Callow start off with them, only to see their attentions dissolve like chocolate in lava after about ten seconds. And then they started arguing. And then they were all telling each other to shut up. And poor Callow is left spluttering at them and being ignored, because he’s not important to them- what’s important is that they get to have their say, and that nobody cusses them. It is, I have to say, the world that some of us don’t just visit, but inhabit in our professional careers. I could have told them this for free. I don’t know who acted as consultant on this program, but they were either deliberately ignored for televisual fireworks, or misinterpreted, because only the greenest of rookies would have thought that this experiment would work in a meaningful way. Disruptive pupils can be distracted for a short time by novelty, or by catching their curiosity. But eventually the teacher has to realise that they can’t be entertained every minute of every lesson. Sometimes, learning is just work, in the same way that sometimes training is just lifting weights or running around a track at six in the morning, and that life isn’t always fun. And that’s when they’ll lose interest, and need to be directed for their greater good. And that means sometimes being strict, and always having rules that everyone has to follow. And the first rule of the classroom is that not everyone can talk at once. If you don’t have that, you don’t have a lesson; you’re just standing in the same room as a crowd of children who happen to be talking to each other. David Starkey came a total cropper on this one, and serves him right. Actually I’m quite angry with Starkey, because in many ways what he said echoed my own opinion- that many of the kids had put themselves in that position, that they needed self-discipline, that without the ability to restrain their own egoist desires they would be slaves to their whims, etc. But then he p*ssed all that good will up against the staffroom wall by being so explicitly, wilfully repellent to the children (for God’s sake, he called one of them fat, and called them all failures) that I’m surprised they didn’t turn him into a totem pole. He blew it in an enormous, spectacular way, and it’s no good stalking off in a huff and saying how awful they were. They were- but so was he. His attitude was one of enlightened superiority, but he displayed less manners than they did in the first few minutes. it was excruciating. The worst part of it is, some will see him representative of the assertive discipline technique, that he is the natural result of a behavioural system that relies on sanctions as well as rewards. He doesn’t- he’s merely one unpleasant particle on the spectrum of that process, and an angry, petulant smear on the windscreen of others who drive more carefully through classroom management. You can be tough and polite; you can be assertive and calm. The kids might well be lucky to have you there, but if they don’t realise it, there’s no point expecting it like some kind of divine right. You have to show them why they should be interested, not rebuke them with insults when they don’t slavishly dance at your every utterance. Nobody can make you do what you don’t want to do; at some level, we have to cooperate with the person controlling us. To get children to behave, they have to know that you care about their education; so much so, in fact, that you’re prepared to use sanctions against anyone who needs some coaxing. With care, rigour and consistency, most children can be engaged with this process. Eventually, the need to punish dwindles as the pupils learn to enjoy the comfort and security of a well-run classroom, and the benefits that it provides to their education. The ones who still won’t comply with this can be dealt with in more selective ways. Sometimes this means exclusion. Sometimes it means that they slip through the net. But no system is perfect, nor should we expect it to be so. For schools to be well run there have to be sanctions against those who resist social mores. People who rebel against the system within which they operate can expect the system to respond. And that is why many of these children end up as NEETs, or other acronyms. Nobody said life was going to be perfect. Sometimes we have to just do our best and deal with the consequences. This program wasn’t a failure at all; it was a brilliant way to generate debate about education, and you know you’ve done something special when kids and non-teachers are talking about how schools are run and what it all means. But the crucial problem with Jamie’s Dream School is that it seemed to assume that teaching isn’t a skill at all, but some kind of verb that happens when you turn up to a room full of kids with ties on. Teaching is an art and a craft, not something stapled on to subject knowledge. I’m still learning to be a teacher, and I hope I never stop. Let’s face it, if even Rolf Harris can’t get his classes spellbound with his boyish, divine enthusiasm, then I think we can safely say that expertise alone isn’t enough. Teaching is a profession, not a job, not an accident that occurs when the educated mean the un. Jamie’s Dream School is in Special Measures, as far as I’m concerned, with a notice to improve. The Head Master, John D’Abbro, has a big job to do, and I’m not sure if he’s up to it; what are the school rules? Are there any? Do the students have any expectations to conform to, or is that merely for the teachers? In other words, is this the Land of Do As You Please for the students, many of whom will have been doing as they pleased for some time? And I fear that after their holiday in Channel Four High School for Narcissists, they’ll find that the rest of the world isn’t that bovvered.